The exact date of these Buddhist holidays varies each year according to the lunar calendar, but you can check here under the Thailand events and festivals section of this site. Whilst many bars and clubs do close on the king’s birthday, there appears to be more leeway on the queen’s birthday. However, this is down to local decisions and unofficial ‘agreements’ with the police so whether bars and clubs are open will depend on where you are in Thailand. It can even be the case that one bar will decide to close, but the one next door will be open. In addition to the dates listed above, alcohol sales are also restricted on election days, including local elections. Is there a blanket ban on alcohol sales? 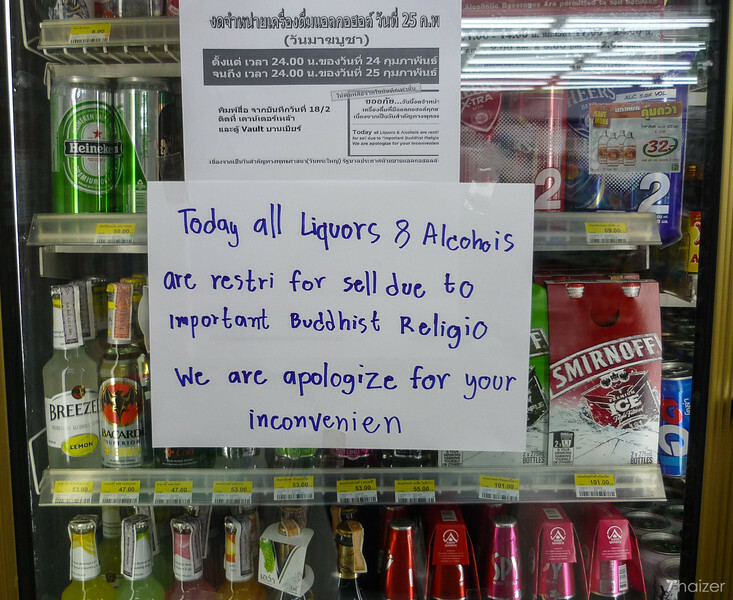 In previous years, the alcohol ban on Buddhist holidays has not always been strictly enforced, particularly outside of Bangkok. In rural Thailand, there seems to be a much more lax attitude to applying the law. In popular tourist resorts such as Phuket and Pattaya, some bars have been known to turn down their music, but still serve alcohol on restricted days. Other venues have resorted to selling beer in coffee mugs to bewildered tourists. Local police use their own ‘discretion’ to decide which venues need to be visited and fined. Stores like Tesco Lotus and 7-Eleven will have signs up on dry days saying no alcohol sales, but not everywhere is treated the same. Hotels are normally permitted to sell alcohol to their guests, but that may change under the current military government. The military government that has been in place since the 2014 coup has been promoting ‘Thainess’ and traditional Thai values. A campaign called Ngod Lao Khao Phansa (no drinking alcohol during Khao Phansa) is an idea from the man currently in charge of Thailand, Prime Minister Prayuth. The former soldier has called for Buddhists in Thailand to abstain from drinking alcohol during the 3-month Buddhist Lent period.